Grouper have recently become more regulated fish, much like the red snapper. This popular culinary fish inhabits deep waters and is more shy and standoffish than the more aggressive red snapper, meaning that they are generally harder to find. Fortunately, experienced Capt. Chad Reyer and The Triple-Trouble can help you land these great fish during a grouper fishing charter trip in Orange Beach, Alabama. Grouper are light gray with mottled brownish patterns. They are one of the most popular fish for eating, however they can be difficult to catch since they inhabit deep waters, with some living at depths of more than 170 feet or hiding in reefs and around rock formations. With The Triple-Trouble, you can travel to these deep offshore waters and find these tasty fish, working to bring them in with selected baits and fishing techniques. There are several different types of grouper, with the gag grouper being the most popular due to its large size. The gag grouper can grow as large as 50 pounds. Grouper also have a few harvesting restrictions, and depending on the species, your catch has to be at least 20 inches to keep. 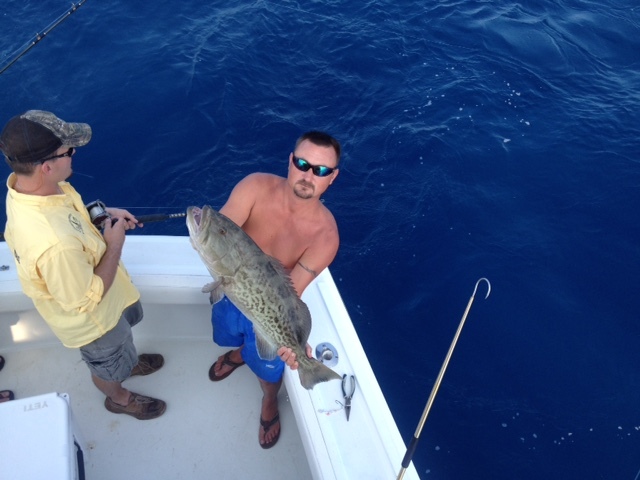 Catch one of the most popular eating fish in Alabama by scheduling your grouper fishing trip in Orange Beach today aboard The Triple-Trouble with Capt. Reyer. Call him at 256-431-5767 to schedule your charter today!